“Although we had seen Rudy for a fleeting outing over Christmas, sadly there was no sign of the ‘Flying Dutchman’ defending his trophy this year! Nonetheless, it was great to have fifteen Illusions out racing on Saturday afternoon in the F3-4 Westerly breeze. 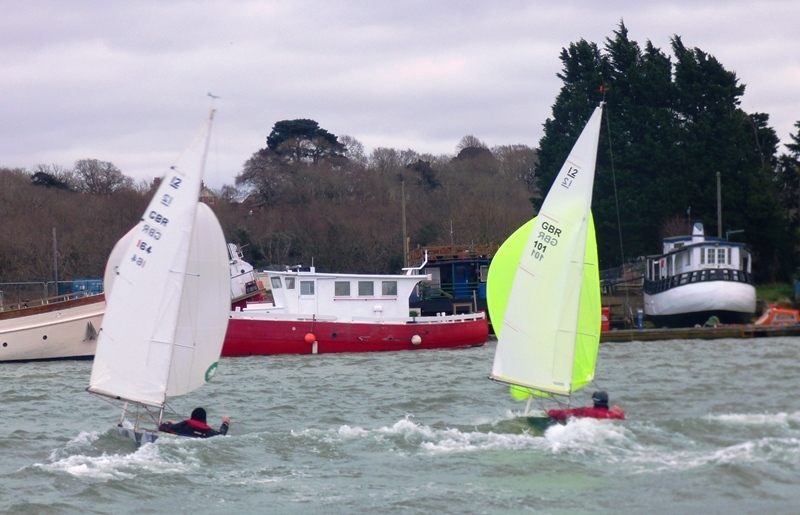 With plenty of room and reasonably smooth waters, the course was set up in the harbour. Three boats over cooked the start of the first race; Jo Downer was able to get back quite quickly but Bruce Huber and Kass Schmitt had more difficulty. Simon Cooper’s black spinnaker was the first to fly on the run to the leeward gate with Mark Downer, Jonathan Nainby-Luxmoore and Jo Downer close behind. Simon held his nerve and managed to extend his lead on the 2nd & 3rd rounds to finish a convincing first. 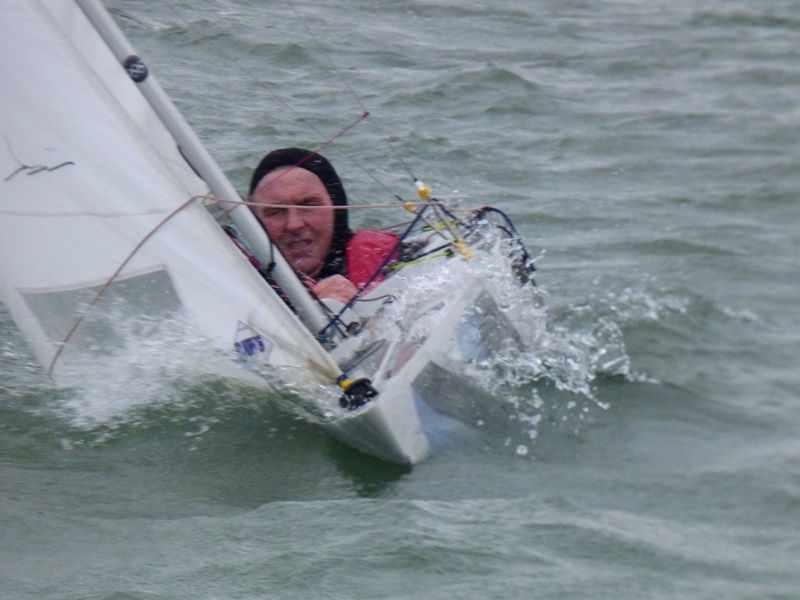 Although he could not get himself close enough to Mark who finished second, Bruce did an excellent ‘catch up job’ after his problems at the start and finished third ahead of Jo. 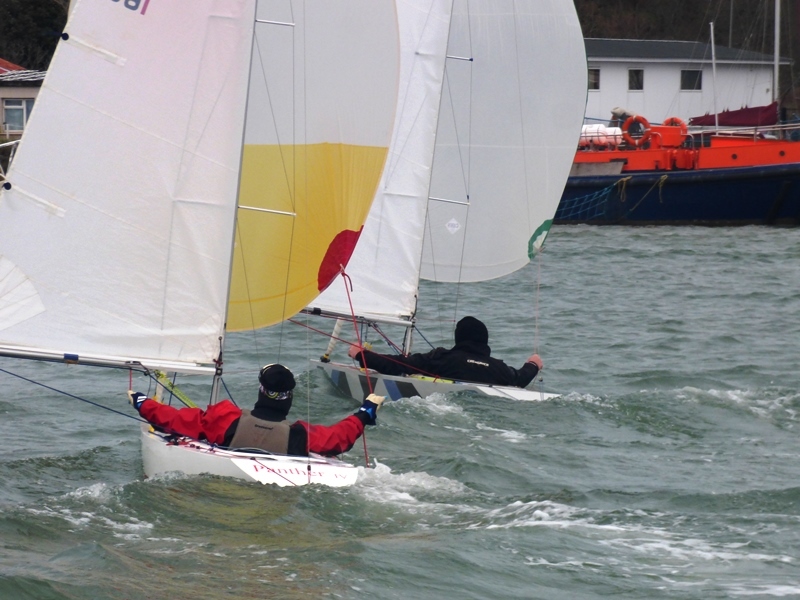 As always, the racing lower down in the fleet was close with Serena Gosling & Robin Ebsworth tying for 9th place. 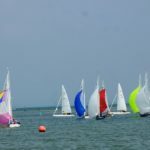 With the breeze flicking 10 degrees plus at times, it was a bit of a lottery which side of the course was the best one to go for. In this case if you had followed Bruce you would have been at the top end of the fleet! 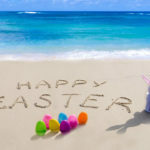 He established an unbeatable lead by the time he reached the windward marks and then simply extended it on the next two rounds. 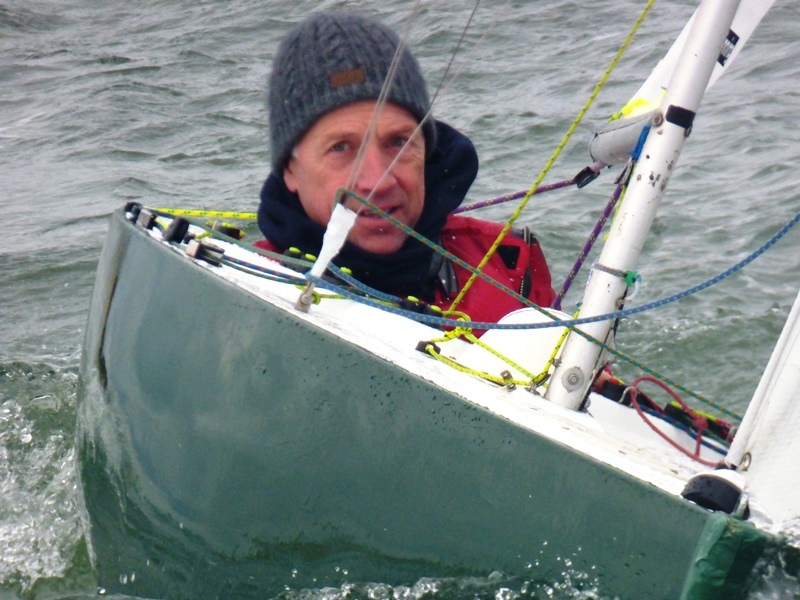 It was particularly good to see Philip Russell leading the rest of the fleet and holding off Mark’s mid-fleet charge to secure second. Mike Toogood was fourth. Conditions in the harbour on Sunday afternoon initially looked a bit bouncy, but this was mainly wind over tide and by the time the first race got underway, it had smoothed off considerable even though the Westerly breeze was gusting 18 knots. After a clean start the fleet soon split tacks; Mark was first round the windward marks with Jo, Simon, Mike & Bruce close behind. In the second & third rounds Bruce moved up to second leaving Jo & Simon to battle it out for third & fourth. By the end of the third round, it was Jo who finished ahead by inches. 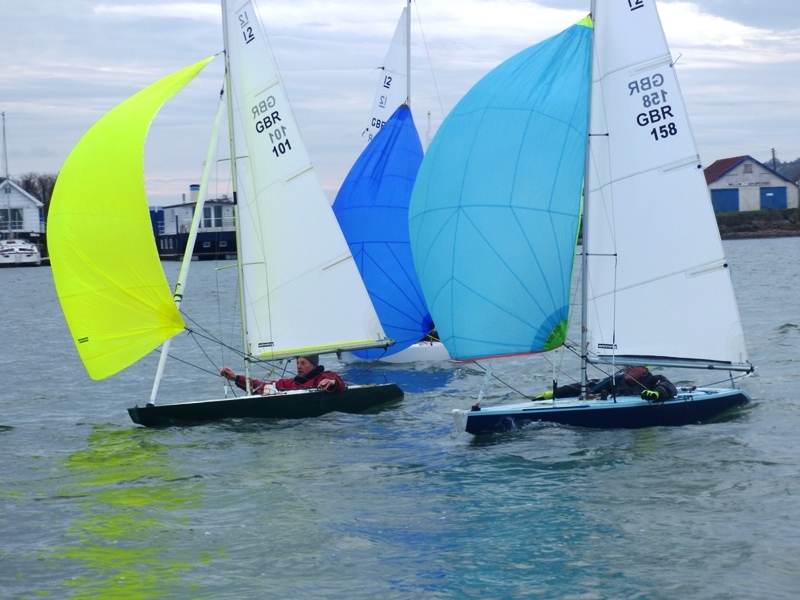 With the sun setting in the distance and the breeze gusting between 15 to 21 knots, the third and final race of the weekend saw another excellent start by most of the fleet. 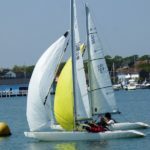 Given their form in the previous six races, it came as no great surprise to see Mark’s white and Bruce’s green spinnakers flying first as they headed back down the course to the leeward gate. 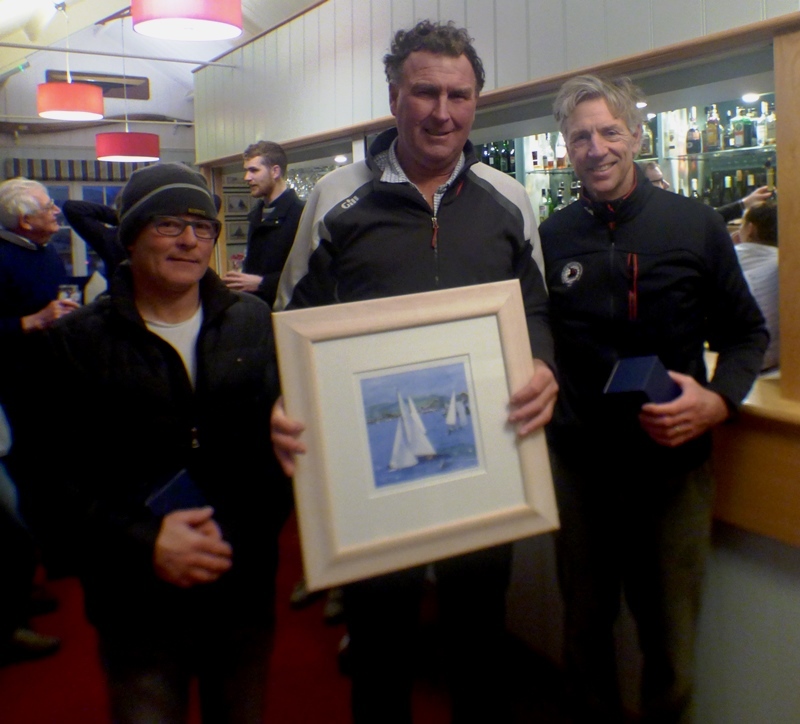 The chasing group was lead by Jo, with Simon, Mike and John close behind vying for the best line to the leeward gate. 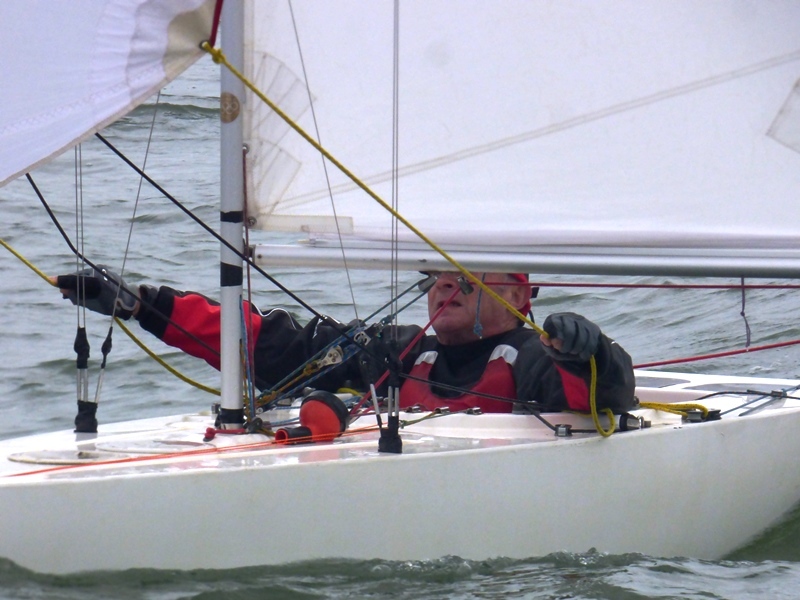 After a slight altercation and problems dropping his spinnaker to take a penalty, John decided to retire and head back to the Illusion Quay leaving the other three to battle it out for third. With Mark well in front and only a catastrophic gear failure likely to stop him gaining his second first of the day, it was decided to shorten the race to two rounds. 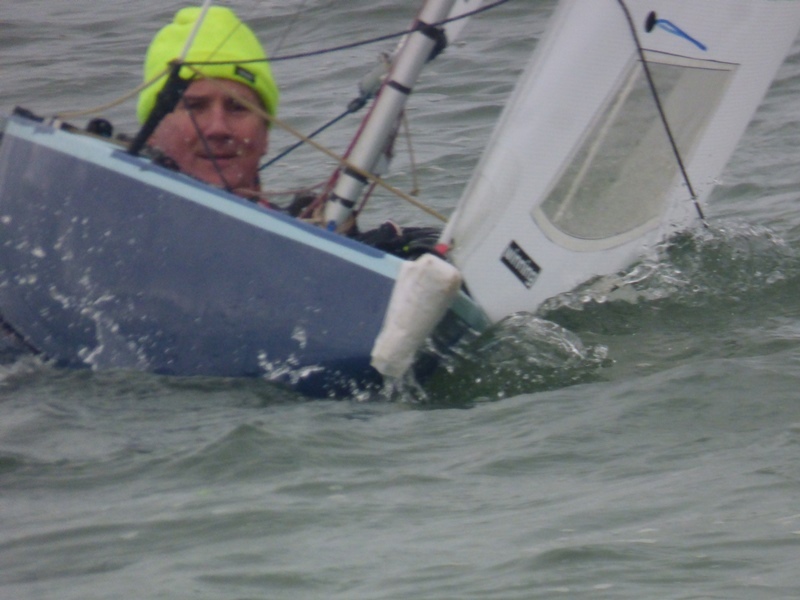 Bruce held onto second well ahead of Simon who was third less than a boat length in front of Jo. Mike was fourth. 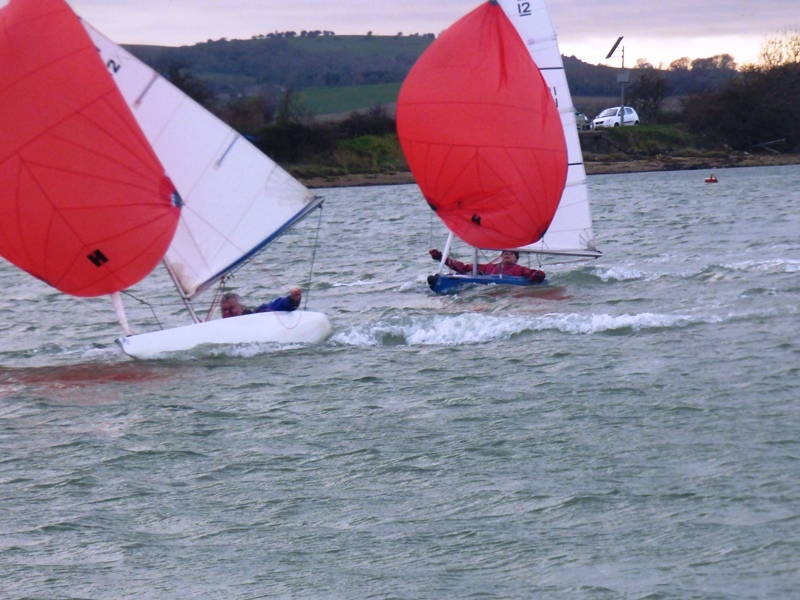 Bill’s Barrel next weekend (19th & 20th January); on completion of the last race on Sunday, the plan is to finish off the Team Racing final between RVYC & SVYC that had to be aborted in early December due to boat damage.